In this free TOGAF poster, we continue to outline the processes in TOGAF that are described outside of the ADM.
TOGAF suggests using the ADM to help you establish your enterprise architecture practice. In effect, the ADM is applied to the EA practice as if it is an architecture that is being delivered. 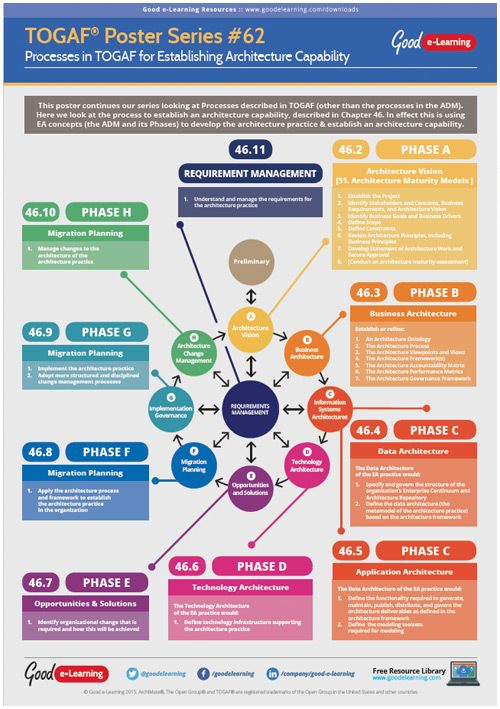 This poster summarizes the suggested activities as described in Chapter 46 of the TOGAF documentation. Download this free TOGAF poster by our EA expert Roger Evernden and by registering you’ll also get unlimited access to our free library of 400+ Business and IT learning resources!